When I found this cut file in the Silhouette store I fell in love with it. I knew I wanted to make some for Christmas gifts. The cut file was so easy to work with. When it's finished it holds several packets of tea. I used some * Kraft cardstock (I buy this stuff in bulk), Pebbles Home for Christmas Gift Tags , and the * Bella Blvd Christmas Cheer collection, to make this box. I'm adding my favorite tea ( * Bigelow Peppermint Tea) to my tea dispenser boxes. My favorite thing about this Christmas gift is that I'm putting my never ending stash of scrapbooking supplies to good use. 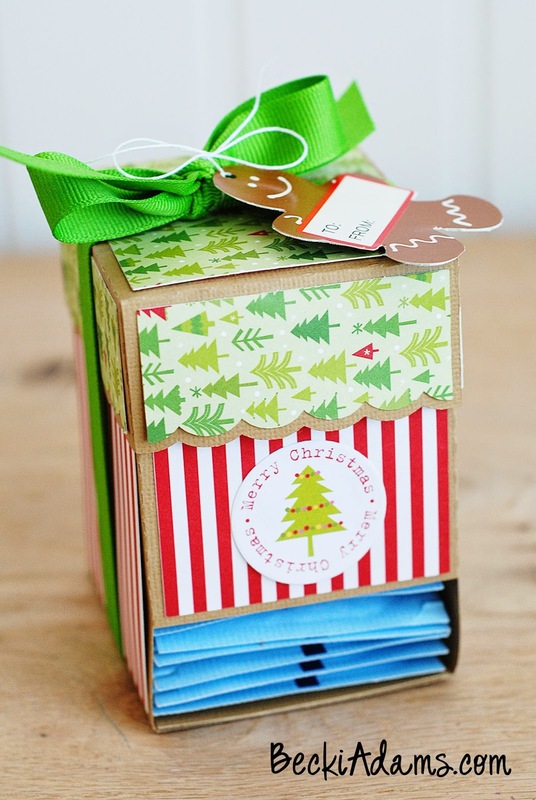 Do you use your scrapbooking supplies to create Christmas gifts?